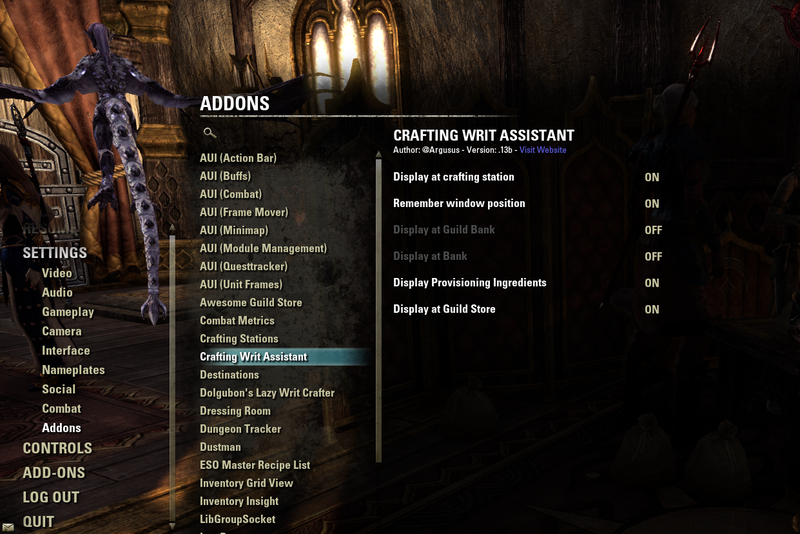 Crafting Writ Assistant will conveniently display the current crafting writ you have in your quest journal when you visit that particular crafting station. See screen shots for examples. 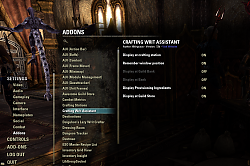 It will display crafting writs for alchemy, woodworking, blacksmithing, clothier, provisioning and enchanting writs. AND now Master Writs! Please feel free to message on my author portal, with any feedback, bugs and requests! 05-27-2018 Added Jewelry crafting writ support. 02-25-2018 Fixed a UI Display bug when turning in a Master Writ. 01-16-2018 Fixed Display issue where the Writ window was not displayed due to zoning bug. 01-11-2018 Fixed Display issue for Second Provisioning Recipe not displaying ingredients. Am getting this error after upfating WritWorthy. It requires to install LibPrice & LibAddonMenu-2.0 separately and since doing that this error popsup evreytime I travel. Screenshot link attached. Last edited by XIIICaesar : 12/04/18 at 11:25 PM. It would be great if this addon worked with the CraftStore and PotionMaker addons so it shows the writ helper box when im cooking or doing alchemy or enchanting. since these addons changes those interfaces it doesnt show me whats up. Awesome, glad you are finding CWA useful. That's interesting that those addons change the UI in such a way that CWA can't display. I will install these to see if I can reproduce the issue. In the meantime, if you have any screen shots of errors, please post them here and that will be helpful. I'll get back to you on this. Working on it today!! I will hopefully have this posted later tonight or tomorrow. I have the code completed and I had some good results from testing so I will have it updated shortly, thanks for your patience! Hey there, thanks for pointing this out. I'll get a update published soon. I like the addon. It fills the need I have and looks really clean. I installed it and reloaded ui and it worked, but hen I traveled to my home after that I got an error. The error appears on each zone change and makes it so the windows doesn't load in the crafting tables. I tried reloadui and that gave a stacktrace with two more listings so that is the one I posted below. Edit: I disabled it, reloaded the ui, re-enabled the addon and reloaded the ui and so far it is working. I've done all of this, including installing the addon through minion, without restarting the game so maybe that is part of it? Either way, it seems to be working for now. Last edited by whizkid338 : 03/20/18 at 11:32 AM. Dailies reset so I tried again. This time the daily writ stayed when it updated with each crafted item. My only guess is that I must have used the drop down to look at the master writ, then used the drop down to go back to the daily writ. And doing that must have been what screwed things up. Thanks for your feedback. I'll see what I can do. I have 'A Masterful Writ' for blacksmithing currently active because I forgot to check if I had enough tempers available before opening it. Anyway, when doing the daily writ, as I craft items and the UI updates to reflect that it switches to the master writ rather than staying on the daily writ. I can keep switching but if someone were to have a master writ active for an extended period of time, this could get annoying real fast. Is it possible to check which writ in the drop down list is being updated and make sure it maintains focus? Hey there, i will work on this to fix. All I had to do was dismiss the error and the game continued on as if nothing happened. Not sure what is going on, thought you might want to take a look. Thanks for pointing this out. I have added a bug fix to prevent this UI error when completing a Master writ. I have reproduce the issue , added a code fix and then completed 3 Master Writs without error now. Please let me know if this doesn't resolve the issue for you. I have a Master Writ in the works. Just need to get a few more tempers. Will let you know what happens when it does get turned in. Might be a few days depending upon how fast I get tempers from deconstruction and daily writs.